Giving murder victims a face is forensic artist Paige Bryant's specialty. She can always put the pieces together. But her work turns dangerous when Texas Ranger Cade Jarvis brings her a special project related to the notorious Lions of Texas. Identifying the victim could help with the ongoing search for the murderer of Cade's boss…yet it also draws deadly attention to Paige. As she contends with attack after attack with only Cade's protection, the two of them draw closer together, learn to open their hearts…and struggle to identify the face of danger before it's too late. Texas Ranger Cade Jarvis gripped the wheel of his pickup truck, his neck and shoulder muscles knotting. He was on the most important mission of his career and nothing was going to stop him from reaching Austin. Nothing. His glance darted to the rearview mirror. He'd been keeping an eye on the erratic movements of a set of headlights approaching behind him. The SUV was speeding, cutting in and out of the heavy traffic as if that driver thought he was on a racetrack instead of the highway. Cade tensed. The guy was crowding everyone he passed and scattering them like a flock of scared chickens. The dark SUV drew parallel with his truck and swerved toward him. Cade sounded his horn. There was no discernible reaction from the speeder. Cade managed to avoid physical contact once, twice. Again. He muttered, "Sober up before you kill us both," and clenched his teeth. The SUV matched him move for move while other drivers did their best to distance themselves from the obvious confrontation. The reckless driver closed the sideways gap so abruptly, so forcefully, Cade couldn't dodge this time. The sound of rending, crushing, sliding metal against metal squealed through the cold November night. Hitting his brakes, Cade braced for an even worse collision. He glanced over at the evidence case resting next to him on the seat and prayed instinctively, "Dear God. Don't let anything stop me from getting that to the forensic artist." Tires sliding, truck body slewing sideways, Cade felt his front bumper clip the supporting post of a highway sign. The pickup's chassis did a 180 and ended up half on and half off the road, facing oncoming traffic, before Cade was finally able to bring it to a stop. The high, bright headlights of an eighteen-wheeler were bearing down on him. He could hear the semi's air horn blasting, its brakes locking and tires squealing. Throwing his arms over his face, he prayed he'd live through the next few seconds. 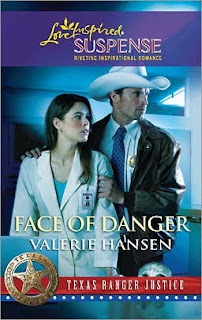 The usually busy Texas Ranger headquarters building in Austin was quiet—except for the beating of Paige Bryant's heart and her niggling feeling that something wasn't quite right. "Stop it. Just stop it. You're being silly," the forensic artist told herself as she leaned out of her studio and peered down the empty hallway. It looked as though everyone in that part of the office had already gone home for the night. Which was where she should be. Where she would be if she weren't waiting for a delivery. She closed her office door and began to pace. It was only about seventy-five miles from Company D in San Antonio to this main Ranger office in Austin, and easy, highway driving almost all the way. What could be keeping that Ranger? She didn't know Cade Jarvis well, but the few times they had met she'd been favorably impressed. Paige huffed, disgusted with herself. Impressed? Boy, was that an understatement. If Ranger Jarvis was half as good-looking as she recalled, he'd be attractive enough to curl her toes. He stood nearly six feet tall, with dusky blond hair and mischievous eyes the color of warm mocha java. And when he smiled, the fine lines of an outdoorsman crinkled at the corners of those appealing eyes, though she doubted the man was much over thirty, if that. She was about to give up on him and head for home when her phone rang. She snatched it up before the second ring. "Hello?" "Ms. Bryant? This is Cade Jarvis," the slightly breathless male voice said. "I'm going to be a little late." He was already more than a little late but something in his tone gave Paige pause and made her ask, "Are you all right?" "I beg your pardon?" It was becoming clear to Paige that this call was not the result of a normal travel delay. "What news? What's happened?" "I was run off the road not far from there." Her free hand flew to her throat and her eyes widened. "Oh, no! Are you all right?" "Fine. Actually, I'm in better shape than my truck is. It would have been a lot worse if other drivers hadn't steered around me after I spun out. As soon as the troopers finish their report, I'll hitch a ride with one of them and have him drop me at your office." "Yeah. Thankfully, there's no problem with the remains I'm bringing you, either. I had the skull packed in a padded evidence bag, so it wasn't damaged by the collision. I figured you'd probably make a composite copy to model the clay over, anyway, but I'd still like to get it to you in one piece." "It is a lot easier—and more accurate—if I don't have to work with an original that starts out looking like a jigsaw puzzle." Still concerned, Paige paused. "Listen, if you tell me exactly where you are, I'll be glad to drive over and get you." "I don't mind. It would give me a chance to peek at the evidence, too. I know how important it is to ID that victim ASAP." The Ranger's chuckle struck her as sounding a bit cynical. When he spoke she was certain. "Oh, I get it. It's not me you're worried about, it's these bones." "I didn't mean anything of the kind." Glad he couldn't see her blush, Paige realized she was embarrassed by how close he'd come to the truth. "I do care about my job," she insisted. "A lot. But that doesn't mean I don't care about living people, too." "Hey, I was just teasing. No offense meant, ma'am." Whew. "None taken. So, do you want me to come get you or do you think you'll be here fairly soon?" While she waited, Paige listened to a hodgepodge of muted conversations in the background. Between the overlap of voices and the humming traffic noise, it was hard to pick out individual words, at least not well enough to tell what was being said. "Ma'am? You still there?" Cade finally asked. "Yes. What did you decide?" "One of the troopers will give me a ride while they haul my truck in so the lab boys can take paint samples from the parts that were sideswiped. I should be at your office within a half hour. Do you mind waiting just a little longer?" "Not at all. See you soon." Hanging up, Paige busied herself tidying her office and trying to catch up on paperwork. Details like that always fell by the wayside when she was concentrating on drawing or sculpting the faces of nameless victims. Victims just like her sister. Paige purposely tried to redirect her thoughts. There was nothing to be gained by beating herself up over past events. Amy was gone. Had been for sixteen years. The pretty three-year-old would probably never be located, alive or otherwise, and there was no way to change what had happened no matter how much Paige wished otherwise. She pulled herself together and lifted her chin. "It wasn't my fault," she whispered into the silence. "I did my best to help her." That was true. And now she reached out to other victims of horrendous crimes and gave them faces. Gave their families closure and a chance at justice. What she did was more than a job. It was her calling. It was also her atonement. Cade thanked the trooper for the lift, squared his white cowboy hat on his head and straightened his tie before heading toward the main Ranger headquarters. He smiled when he saw a slim woman in jeans and a denim jacket waiting for him next to the rear entrance. "That's me. We have met before, you know." She extended her hand and Cade shook it. "In San Antonio." "I do remember you. It's just kind of dark out here and I wasn't positive." Actually, he'd recalled very little about the Rangers' only forensic artist other than her being in her mid-twenties and having long, dark hair that she'd kept tightly gathered at the nape of her neck. Add to that the plain, half glasses she'd worn for close work and the woman had been the spitting image of a stern schoolmarm in an old Western movie. When he saw her this time he immediately changed his mind. Paige Bryant was lovely, with expressive green eyes and long, loosely swinging dark hair that rippled around her shoulders and brushed against her cheeks as she tilted her head. "I waited out here for you because I figured you didn't have a key card for this door." "Is that the victim you told me about?" she asked, eyeing the blue, cubelike case. "Yes." Sweeping his free arm toward the door he said, "Shall we? It's cold out here and I know you're anxious to see what I've brought you." She slid her card through the reader next to the outer door and led the way to her office. Cade had never visited this particular room before so he was taken aback. It looked more like a cozy artist's studio than it did a scientific laboratory. He spotted several computers at work stations and a small, boxy, black machine he didn't recognize. Beyond that, the place was arrayed in a personal, extremely artistic manner. There were rows of framed pictures of faces on one wall, a window on another and tall filing cabinets on the third. Beside them hung a painting of an ethereal-looking child whose face seemed to drift in the mist of the artist's imagination. Cade set the case on the nearest table and approached the painting while Paige removed her jacket. "This picture is amazing. Did you paint it?" "Yes." She was unzipping the carrying bag as she spoke. "Tell me again what you know about this victim." "Not a whole lot," Cade replied as he joined her. "We're pretty sure he's tied to Gregory Pike's murder. We just can't prove exactly how." "I guessed as much when I was told to drop everything and give your case my full attention," she said with evident empathy. "We're all still in shock after what happened to Captain Pike. How's the rest of that investigation coming along? Any hits on the sketch I made from his daughter Corinna's description of her stalker?" Cade nodded soberly. "Yes. We got him." "Wonderful. How about the likenesses I created from my photos of the man in the coma?" "Those helped, too. We still don't know his name, but a witness saw the pictures and came forward with some information." "So, what do you know?" "He's Irish. The witness remembered his brogue." "Good. At least that's a start." "Yeah. A mighty slow one." Cade sighed. "Greg was special. He was more than my superior, he was my friend and mentor. I owed him plenty. Still do." Paige donned latex gloves and carefully lifted the skull, supporting the lower jaw as she turned the relic in her hands to assess it. "I'm confused. What makes you think this death is associated with Captain Pike's? Under normal conditions it can take from six months to a year to reduce human remains to a skeletal state. This man must have died long before the captain was killed." Cade nodded. "The Lions of Texas drug cartel is the link. It has to be. Did you know that Pike had ordered all of Company D to rendezvous at his house just before he was shot and killed?" "Yes. Corinna told me all about it while I was making the sketch of the man who broke into her house. Did you ever figure out what her father was so eager to tell all the other Rangers?" "We have an idea. Apparently, the Lions were afraid there was incriminating evidence in the house. They sent someone to retrieve it, and Corinna interrupted. Since she could ID him, he decided to take her out." "Poor Corinna. Is she all right?" "Yes. Now she is. When we finally nabbed her stalker, he told us he worked for the Lions and mentioned a drug drop site the Lions were still using. We put a Ranger undercover and staked it out, hoping to catch them in the act." "In a manner of speaking. We may have gotten something better." He pointed. "The skull you're holding was dug up on that property while we had it under surveillance. It's too big a coincidence to overlook. There has to be a connection between that murder and the drug cartel." "Were you able to arrest anyone at the grave site?" "Not at that time, but it worked out in the end. All we got at first was the jacket of the guy who was trying to retrieve the skull. Later, a man named Greco came after Jennifer Rodgers, the woman who owns the property on which the drop site and skull were located. Greco was killed by the Ranger we had working undercover there." "Uh-oh. He didn't talk first?" "No." Cade frowned and gestured at the skull. "If you can help us ID this guy, we may be able to make more progress than we have lately." "What about the guy in the coma? Could he have been a secret informant for Captain Pike? He was found shot at the house alongside Pike's body, right?" "Yeah. He's still in a coma so we can't question him, although we do have hope he may recover. They say he moved his fingers slightly. All we have to work with right now is his photo and the fact that he's Irish." Cade tilted his head toward the skull she was holding so gingerly. "Which leaves that as our only other clue at present. That's why it's so important. So important that I've been ordered to stick around until you finish the facial reconstruct—"
Without any warning, all the overhead lights blinked off. "Hold your horses," he said. "I'm sure it's nothing. The emergency generator should kick on in a few seconds." "I wonder. Look outside. The lights in the parking lot are still working." Cade's right hand instinctively went to his gun, his palm resting on the grip, his thumb unsnapping the tab that kept it in the holster. "You're right. Stay where you are. I'll go have a look around." He heard shuffling. Then she grabbed the sleeve of his leather jacket. "The silly part is how afraid I get when it's totally dark. Either you take me with you or I'll probably panic and get hysterical." She drew a noisy, shaky breath. "I mean it. I know it's stupid and irrational but I'm really, really scared." "Okay. You can come. Grab the evidence. We're not leaving it unguarded." He heard the slide of a zipper as she closed the carrying case. Now that his vision had adjusted more to the darkness he could see enough via the reflected exterior lights to move around safely, even in such unfamiliar territory. "Got it," Paige said. "I'm ready." Judging by the quaver in her tone she was truly frightened.